"As an American living abroad I think Oslo, Norway is a great city," writes Lynn Rosentrater. "With only 500,000 residents, it has a small town feeling. Yet, as a European capital, it is very cosmopolitan. Oslo takes center stage every autumn when the Nobel Committee announces the recipient of the annual Peace Prize. After the former Finnish president Martil Ahtisaari was recently awarded the Peace Prize for 2008, I made my way downtown to the Nobel Peace Center to learn more about him and other Nobel laureates." 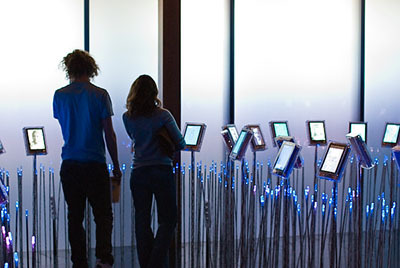 "One of the permanent exhibits at the center is a virtual garden with motion sensors that trigger presentations of each Nobel laureate's history and philosophy when it is approached by a visitor. The installation hums with life and the glow of the room is intoxicating so I had to try to capture it." "I snapped this image (one of two in total) as a couple made their way through the sparkling blades of grass. I shot it in RAW using a Nikon D80 with a 50mm lens at ISO 800, f/2.2 and 1/20 sec. After setting a proper white balance using Lightroom, I straightened the image, but have otherwise not done any processing."